On the 12th (Sun), add some adventure to your tour with a kayaking and canoeing tour and then examine the collection at Sea Turtle Conservancy. For photos, other places to visit, more things to do, and more tourist information, read our Tortuguero online day trip planner . San Jose to Tortuguero is an approximately 3.5-hour shuttle ride. Traveling from San Jose in August, you can expect nighttime temperatures to be somewhat warmer in Tortuguero, with lows of 26°C. Finish your sightseeing early on the 12th (Sun) so you can take a shuttle to Puerto Viejo de Talamanca. Start off your visit on the 13th (Mon): stroll through Playa Chiquita, then experience rural life at Chocorart, and then enjoy the sand and surf at Punta Uva Beach. To find traveler tips, ratings, where to stay, and other tourist information, read our Puerto Viejo de Talamanca day trip planning website . Traveling by shuttle from Tortuguero to Puerto Viejo de Talamanca takes 5 hours. Alternatively, you can do a combination of shuttle and bus. Wrap up your sightseeing on the 13th (Mon) early enough to drive to Playa Hermosa. Start off your visit on the 14th (Tue): take a memorable tour with Tours, then view the masterpieces at Rojas Bros Boruca Indigenous Arts, and then enjoy the sand and surf at Playa Hermosa. For traveler tips, where to stay, photos, and tourist information, refer to the Playa Hermosa holiday planning website . Getting from Puerto Viejo de Talamanca to Playa Hermosa by car takes about 7.5 hours. Other options: do a combination of shuttle, taxi, flight, and bus; or do a combination of shuttle, flight, and taxi. Wrap up your sightseeing on the 14th (Tue) to allow time to drive to La Fortuna de San Carlos. Start off your visit on the 15th (Wed): hike along Ecocentro Danaus and then witness a stunning natural landmark at Tabacon Hot Springs. Get ready for a full day of sightseeing on the 16th (Thu): get a new perspective on things with Boat Tours & Water Sports, then witness a stunning natural landmark at Paradise Hot Springs, then get a taste of the local shopping with Onirica Art Gallery, and finally view the masterpieces at Galeria Estudio. Plan a trip to La Fortuna de San Carlos easily and quickly by telling Inspirock to suggest an itinerary. You can drive from Playa Hermosa to La Fortuna de San Carlos in 3 hours. Other options are to do a combination of bus and taxi; or do a combination of bus and shuttle. Finish your sightseeing early on the 16th (Thu) so you can travel to Manuel Antonio. 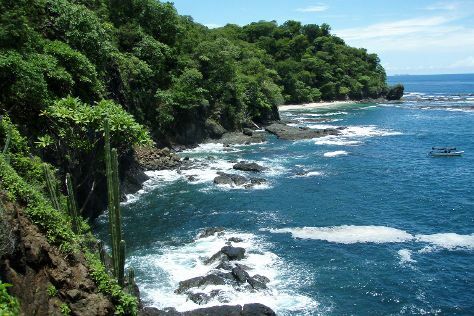 Start off your visit on the 17th (Fri): tour the pleasant surroundings at Playa Manuel Antonio and then get a new perspective on things with Boat Tours & Water Sports. On the 18th (Sat), you'll have a packed day of sightseeing: tour the pleasant surroundings at Playa Biesanz and then let the river carry you with a rafting and tubing tour. To find traveler tips, photos, other places to visit, and other tourist information, go to the Manuel Antonio route builder website . You can do a combination of taxi and flight from La Fortuna de San Carlos to Manuel Antonio in 1.5 hours. Other options are to drive; or take a shuttle. Wrap up your sightseeing on the 18th (Sat) to allow time to travel back home.